A Hallmark Care Home resident has celebrated her 95th birthday in style at The Ritz, after winning our wish-granting competition. Gwen Vigliaturo, 95, was chauffeur driven to the quintessential British experience with her cousin and his wife, where she enjoyed the luxury afternoon tea and was sung happy birthday. When Gwen, a resident at Lakeview, our care home in Lightwater, was asked to write down a wish, she revealed she was keen to celebrate her next milestone at the iconic London hotel. 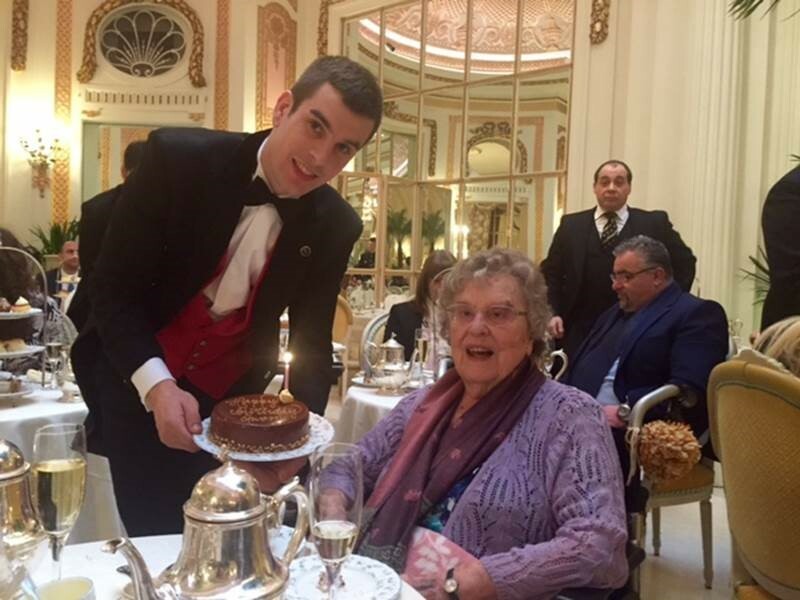 She had celebrated her 90th birthday at The Ritz, famous for its afternoon tea and had enjoyed the ambiance so much, she wrote down the request to do so again. Lakeview Care Home, which specialises in residential and dementia care, granted Gwen’s wish after deciding she should be the homes winner of its Christmas wish competition. Gwen said: “I had a wonderful time at The Ritz, I especially enjoyed the champagne and the lovely birthday cake. Gwen who used to work for the International Telephone Exchange as a switchboard operator and interpreter was accompanied to afternoon tea by her cousin Duncan Adams and his wife, Sarah. The granted wish for the resident is just one of many, Hallmark Care Homes has pledged to make true this year for each of its 15 care homes in England and South Wales. Find out more about Hallmark Care Homes Christmas wish competition here. Click here to find your nearest Hallmark Care Home.